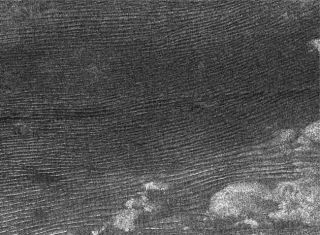 Image of the Belet sand sea at about 12 degrees South and 100 degrees West on Titan. Recent images of Titan, Saturn's largest moon, bear a striking resemblance to some of the deserts on Earth. The pictures, captured by the Cassini spacecraft as it flew by Titan last October and released today, show sand dunes at Titan's equator much like those in the Sahara desert. "It's bizarre," said Ralph Lorenz of University of Arizona's Lunar and Planetary Laboratory. "These images from a moon of Saturn look just like radar images of Namibia or Arabia." On Earth, all wind is ultimately a result of heat differences produced by sunlight that warms the planet unevenly. Scientists have long assumed Titan is too far from the Sun to have solar-driven surface winds powerful enough to cause sand dunes. But hey have more recently learned that Saturn's powerful gravity creates tidal effects in Titan's thick atmosphere. This tidal force, almost 400 times greater than that of Earth's moon tugging at our oceans, dominates near surface winds on Titan and sculpts dunes that are up to 330 feet high. The new images, revealed in the May 5 issue of the journal Science, are evidence that these dunes were built from winds that blow in one direction before switching to another and then back to the first direction and so on. The tides cause wind to change direction as they drive winds toward the equator, Lorenz said. This back and forth pattern cause the sand dunes to build up in long parallel lines. These tidal winds combined with Titan's west-to-east zonal winds create dunes aligned nearly west-to-east everywhere except close to mountains, which alter wind direction. Scientists also thought that the dark regions on Titan's equator were in fact seas of liquid ethane that trap sand. But the images reveal something different. "If you look at the dunes, you see tidal winds might be blowing sand around the moon several times and working it into dunes at the equator," Lorenz said. "It's possible that tidal winds are carrying dark sediments from higher latitudes to the equator, forming Titan's dark belt." The sand on Titan might have formed when liquid methane rained and eroded the ice bedrock. Although it doesn't rain frequently on Titan, when it does rain it really pours. Energetic rain that triggers flash floods may be a mechanism for making sand, Lorenz said. The sand could also have come from organic solids produced by photochemical reactions in Titan's atmosphere.